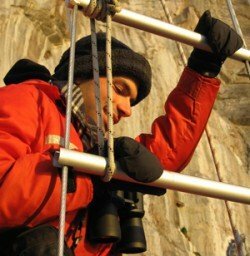 Intro from Jay Allison: Ari Daniel Shapiro is following that well-worn career path from Killer Whale Biologist to Public Radio Producer.This piece is an homage to his former profession--a gentle paean to the passion field biologists feel for their work, and, in this case, for whales. It also confronts the quandary that plagues both journalists and biologists: What if your quarry doesn't show up? How do you still tell its story?Ari has been working with us at Atlantic Public Media in Woods Hole, and we're also featuring a bunch of the "Science Minutes" he's made, and an amazing ninety-second video tribute to cell division, with an unexpected musical soundtrack. I’m a scientist. Well, that used to be my fulltime job. Now I make radio and multimedia about science…mostly. Let me back up. While I was finishing my PhD in oceanography, I thought about what I would do when I graduated. I wanted a job where I’d continue to learn. And I wanted to have the chance to be creative. I considered academics, maybe science policy. And I also thought about doing radio. I met up with Samantha Broun at Atlantic Public Media and discovered they were making “science minutes” for WCAI, the local radio station in Woods Hole. More about those science minutes later. I began to see how I could blend my academic training with my burgeoning interest in radio. As a scientist, I studied marine mammals. Seals. Dolphins. Whales. But mostly killer whales. Last summer, I made plans to visit my friend Volker who was searching for killer whales off the Shetland Islands (north of Scotland). I decided to bring along some gear and make a radio piece about the trip. Before leaving, Jay Allison and Viki Merrick gave me a lot of advice: Record everything. Talk with the locals. Capture conversations. Remember that the characters I find charming will probably charm others who are listening to the piece. Use the microphone like a diary, a confessional, a cell phone. Capture the sights, tastes, smells, textures of Shetland. 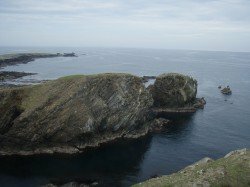 I went to the Shetland Islands hoping for at least one incredible encounter with the killer whales, which would allow me to capture the excitement of doing fieldwork, the joy of science in action. I had anticipated recording the adrenaline and eagerness in Volker’s voice as he coordinated the field effort aboard the small inflatable boat. The sounds of sea spray, killer whale exhalations, and shrieks of discovery each time an animal surfaced. But I learned that in radio, just like in field biology, you don’t always get what you want. 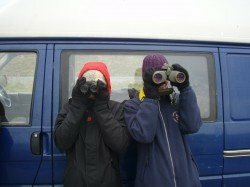 I stayed in Shetland with Volker and his field team for almost 5 days. But each day passed without our seeing a single killer whale, an outcome that was not all that unexpected (as a scientist) though somewhat disappointing (as a radio producer). I recorded as many of the locals and tourists as I could and interviewed the field team at great length. I captured ambient sounds (the wind, the birds, the hum of a motor, cooking noises, an impromptu chorus of the field team blowing air over beer bottles one night in the cabin) and transition sounds. But no whales. Maybe I had forgotten to contact their agent. I came home with hours of tape and not a single killer whale encounter. Obviously, this changed the type of story that I could tell. I had to rethink my plan. When I returned to Woods Hole, I played the tape for Jay and Viki and they pushed me to rethink the piece through a more human lens, one that considered what motivates people to pursue their passions even if it means waiting around for days with no pay-off. That advice really helped. So I made this piece instead, which is more about the search than the reward. And I hope that kind of quest is something that lots of people – those that study killer whales and those that don’t – can relate to. I used a Marantz 620 digital recorder and Beyer MCE 58 omni microphone. I liked the setup because all of my gear fit into the mic bag, which made it easy to transport in the field. Atlantic Public Media initiated the whole Sonic IDs idea that other local NPR stations have picked up. Like sonic IDs, science minutes (also produced by Atlantic Public Media) are brief (30 – 90 seconds), sound-rich portraits. But science minutes are portraits of scientists, their work and its relevance to everyday life. Listening lets you peer into a microscope, glide across the sea floor, or climb into a volcano. Like any good story, they need to have a beginning, middle, and end (and a hook, of course). And with science minutes, the listener needs to learn something new. This was a perfect first radio assignment for me because I’m as fascinated with people as I am with killer whales. I immediately began thinking of articulate and passionate scientists, and I went and hung out with them in their labs with my gear. The first radio interview I ever did was with Sheri White, an energetic woman who routinely travels to the bottom of the ocean to do her science. I had the chance to interview Peter Slater, my former Master’s advisor in Scotland, when I returned to St. Andrews for a conference last summer. Peter has devoted his life to studying birdsong, and is one of my favorite mentors. A good friend of mine suggested I contact Amy Bower in Woods Hole since her personal story interacts with her science in a compelling way. Another friend put me in touch with two scientists at MIT. One of them, Peter Reddien, studies planaria, a type of freshwater flatworm. I remember doing some experiments on planaria in high school. But I couldn’t believe what Peter showed me in his lab. Have a listen. Hazel Sive and I talked for 90 minutes about her work studying how an embryo develops. In the last 10 minutes, she mentioned how she draws parallels between science and music. The rest just fell into place for a science minute. And then it blossomed into the video below. Thanks to Volker Deecke for providing photos. I listened to this piece on the radio as I was waking up this morning. I thought to myself, this is remarkably good. Very interesting. Very entertaining. And I couldn’t put my finger on why because I couldn’t care less about the topic. This reminds me of the piece that Jay Allison did a few years ago. He was moving out and had to buy new household items. How in the heck could that be interesting? But it was because of the way it was produced. This, too, is an exceptionally well produced piece. It has a subtle magic that caught my attention. I’ll be listening to it again just to see if I can figure out what made it outstanding. One thing I do know is that music at the end was a great touch. Many thanks for your message, and for taking the time to write. I’m eager to hear whether you’re able to put your finger on what you liked after listening a second time. The music is indeed wonderful: I love listening to it. Volker recommended this group to me — they’re called Fiddlers Bid, and they’re from Shetland. We tried to weave that kind of authenticity throughout the radio piece. It really helped, for example, that the scientists opened up to me as I spoke with them over the few days that I was visiting. I found their insights and comments very authentic. what kinds of questions do you ask scientists in order to get them to explain themselves and their work in non-science terms? you make science interesting and inviting to non-scientists which is pretty incredible! Congratulations on having your piece air on Weekend Edition Sunday, Ari. For those who missed it, there’s a great video and additional sounds of killer whales included on the NPR page. Thanks so much for your comment! I’m glad you’ve found the science in these pieces interesting and inviting. When I go into an interview, I listen to what my interviewee is telling me from the perspective both of a scientist and of someone who does not have a science background. Sometimes the scientist is accustomed to communicating information in a way that’s immediately understandable. Other times, I ask them for analogies or to translate it into terms that anyone can understand. Here’s an example: Certain scientists work on small things and talk about size in terms of microns or nanometers. In a situation like this, I might ask them if it’s about the size of a sand grain or how much smaller it is than the width of a human hair. So I think it’s about translating on the fly. It’s probably like most interviewing — you try to get the information you need while making the conversation as understandable as possible for the audience. And if an opportunity for discussion opens up that you didn’t anticipate, follow it. Thanks again for writing, Sarah! This is a really great piece- the plainspoken but passionate language made me feel like I (suddenly) love whales more than I realized. *Loved* the sirens > whale calls sonic transition in the beginning! This was the best kind of science piece (or any piece)…where you managed to educate us, while still preserving the mythical attraction to the subject. Was that a balance you consciously held in mind? The bit of you watching whales while local people watch you watch whales…gave me an amusing sense of our place in the animal kingdom. At the same time, the bit about scientists coming to understand one another through the specifics of their appreciation for whales was a lovely touch. Also- a few Shetland accents always improve any radio piece. "I take my hat off to it!" ok…and the CELL DIVISION MULTIMEDIA PIECE!!!! I really appreciate your warm comments on these pieces. I’m glad that you found yourself a bit more of a whale enthusiast after you finished listening. I remember that when I used to explain my PhD topic to people, whales made for a somewhat easy sell to the uninitiated! The ambulance siren idea came from a group of third graders. I played a collection of killer whale sounds to a roomful of kids and asked them what the vocalizations sounded like. A few of them thought the sounds resembled a police car or ambulance. From that day forward, I often confused the sirens myself when walking down the street. I think the balance between the science content and the storyline (here, the mythical attraction to whales) is really important in a radio piece. Jay certainly helped me provide that balance here. And I think it was something that we were really trying to do with this story since it didn’t have the climax (of actually finding the whales!) that we were originally hoping for. Instead, a more lyrical homage to the animals and the search for a treasure presented itself as a possible way forward for the piece. We are indeed all part of the natural world, and I’m glad this piece spoke to you on that point. Thanks too for your kudos on the cell division piece. Hazel Sive deserves most of the credit since it’s her creative mind that formed the connections to begin with. I’m working on a longer piece about the connections that Sive draws between science and music. Stay tuned! Hi, I really enjoyed the piece- and particularly the soundscapes of the whales. If I had any feedback, I’d say I feel like you could have strengthened the narrative structure somehow, – I didn’t really have a sense of a beginning middle and end, or a conclusion being reached at the end.